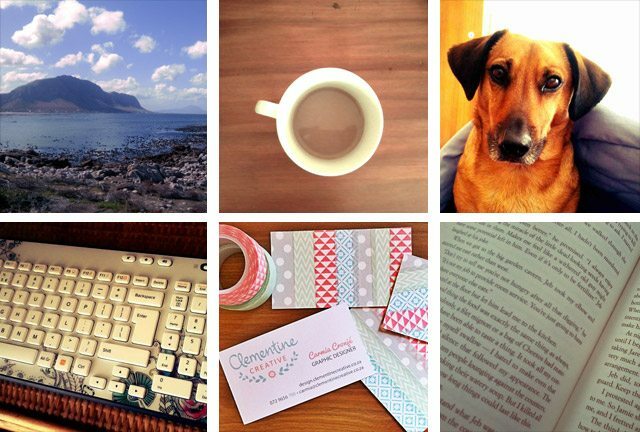 I recently stumbled across a gorgeous blog offering the prettiest printables, blog buttons and fab fonts… after browsing around a bit I realised that the site was in fact run by a South African based in the Helderberg and I decided I needed to get in touch with the blogger behind Clementine Creative, Carmia, and include her in my “What I…” blog series. Fortunately she had heard of me and was keen to take part! Pop over to her lovely online space for a creative fix, she has wonderful DIY stationary kits and cards for you to make your own beautiful Christmas cards and gift tags! Thanks for taking part Carmia – it’s lovely to “meet” you here! I know for sure that if you work hard and trust in God, amazing things will happen. Being my own boss, learning new things, animals, the ocean, rainy days, the mountains, tea and buying gadgets and new computer stuff (nerdy, I know). Everything. Books, magazines, blogs… I’m addicted to reading. I read product packaging, newspapers, leaflets, the placemats at Spur… Basically, if it has words on it, I will read it. I want to travel overseas – I especially would love to see Europe. Jeans, tank tops (especially striped tops), t-shirts, hoodies, sneakers, pumps, sandals. I don’t own one pair of high heels. I need to exercise more and also take my dog on more walks. I need to stop worrying about minor things and be a calmer person. Thanks so much for the interview, Kathryn!